Successfully Added CCD Car Camera and Recorder Kit to your Shopping Cart. Finally a way of proving you're in the right without a doubt, this robust vehicle camera and recorder kit will always confirm your innocence. The CCD camera can be easily be mounted on or in your vehicle and will send the picture back to the reciever to record your exploits. The capture is done at 5 frames a second and written in MPEG4 AVI format to an SD card (512MB card included-support for up to 2GB). Playback can be achieved from the video out of the recorder or by simply removing the SD card and plugging it into a PC or MP4 player. When using the included 512MB unit you are able to record a 60 minute buffer of your journey, after 60 minutes recording will be begin over the start, this is an overwriting record, this means you can plug in the unit and leave it set up for long periods of time until you need to view something that happened while driving. 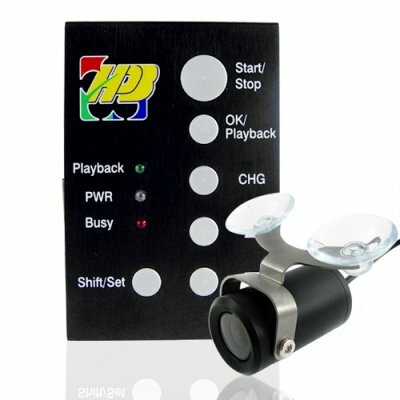 Uses vary from simple piece of mind to full race monitoring if set up in a race car. This really is the ultimate setup and forget system that could quite possibly save you big money in insurance bills sometime in the future. Buy today from Chinavasion and take advantage of our excellent wholesale prices, dropshipping service and 12 month warranty..
Automatic Overwriting, constantly record whenever you are driving.